Image caption Patrick said he was "totally out of order"
Cambridge United player Jordan Patrick has been fined £750 for racially abusing a taxi driver and threatening a policeman in a drunken outburst. Patrick, 20, who had admitted assault and racially aggravated harassment in relation to the May incident, was sentenced by magistrates in the city. 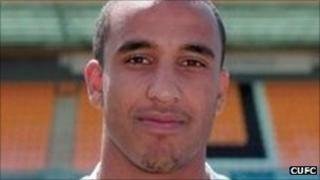 The footballer, of Mildenhall, Suffolk, has issued an apology to his victims Gentjan Hakrama and PC Linas Pekarskas. Patrick said his "deplorable behaviour" had let himself and the club down. In a statement on the Conference National club's website, Patrick said: "I would like to apologise to Mr Hakrama and PC Pekarskas for my deplorable behaviour that night. "I was totally out of order. I was drunk, which led to me becoming aggressive and abusive, but there is no excuse for my actions. "I know that I have let down everyone connected to the club - most importantly the fans. "My actions have caused embarrassment to the club and I am very sorry. "I can't change what has happened but I can only promise to learn from this mistake, change my behaviour and never let the club down again." Patrick, who admitted the offences at a previous hearing, was ordered by Cambridge magistrates to pay compensation of £50 to Mr Hakrama at Wednesday's hearing. He must also pay £450 court costs and a £15 victim surcharge. Magistrates in Cambridge heard that Patrick had ridiculed the Albanian driver before punching him through the open taxi window. When PC Pekarskas arrived to calm the situation he was also subjected to abuse and shoved to the floor by Patrick. Cambridge United said on its website: "The club takes its position within the local community very seriously and constantly reminds the players of their responsibility as role models on and off the pitch. "Players agree to a strict code of conduct which sets out our behavioural standards."